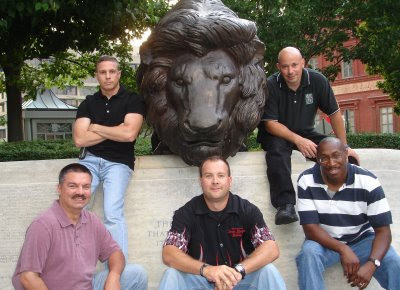 This photo was taken on 6-21-08 at the National Law Enforcement Officers Memorial in Washington, D.C. That day was the third anniversary of the end of watch of our fallen team member, Sgt. Steve Gaughan (#1734, EOW 6/21/05) of the Prince George's County (MD) Police Department, District VI, Special Assignments Team. Sgt. Gaughan was killed in the line of duty when he was shot by a suspect during a traffic stop bailout. The killer was apprehended on scene and later convicted in court. The defendant is currently serving life without parole for Sgt. Gaughan’s murder. This photo would be the last one taken of the Special Assignments Team as a group. Tragically, Sgt. Richard Findley (#2515) was killed in the line of duty just six days later, on 6-27-08, when he attempted to stop two suspects driving a stolen truck. The driver intentionally ran over Sgt. Findley to escape as Sgt. Findley was approaching the truck from the front and Cpl. Kelvin Scruggs was approaching the truck from behind. After Sgt. Findley was struck, Cpl. Scruggs rushed to his aid, while I chased the defendants in a vehicle pursuit and again on foot after both defendants bailed out of the truck and ran into a nearby apartment complex. I cornered the defendants in an apartment building and kept them at bay until backup units arrived and took both defendants into custody. The members of the Special Assignments Team in the photo are as follows (clockwise, starting top right, at 1 o'clock): Sgt. Richard Findley, Cpl. Kelvin Scruggs, Sgt. Jeff Schreiber, Pfc. James Beasock, and Cpl. Ken Evans. I worked with Sgt. Gaughan for four years before he was killed. Sgt. Findley and I worked together for seven years before he was taken. Both of these men were very close to me both professionally and personally, and I considered them brothers and family in every sense of the word. There is not a day that goes by that they are not thought of at least a 100 times. My desk is plastered with reminders of them, in many personal photos of all of us together and in their names etched on paper at the National Law Enforcement Officers Memorial. NLEOMF Chairman and CEO Craig W. Floyd delivers the commencement speech at the Frederick Police Academy graduation today at 2 p.m. The Academy, western Maryland's longest, continuous certified police academy, will proudly graduate 13 recruit officers, trained and ready to protect and serve Maryland's communities. Many of the Academy recruits made a special trip to the Memorial earlier in June as part of their training, to reflect on the heroism and sacrifice of law enforcement, and to remember Officer Richard Mark Bremer, Frederick (MD) Police Department, who died October 23, 2008, in a traffic accident while in pursuit of a suspected drunk driver. Graduates of the Academy include one Thurmont police officer, three Annapolis police officers, and nine Frederick police officers. Harley Winner Picks Up Bike! National Police Week raffle winner, Lt. Anthony Greathouse of the New Jersey Department of Corrections, picked up his 2009 Harley-Davidson FLHTCU Peace Officers Special Edition motorcycle this morning from the Memorial Fund Visitors Center & Store in Washington, DC. Lt. Greathouse bought three raffle tickets on May 13. When he received the phone call two days later that he had won, he said it didn't sink in for a while, until he went online and saw his name on the NLEOMF website. Recalling the congratulatory phone call he received from Herb Giobbi, the NLEOMF's chief operating officer, Lt. Greathouse said, "Honestly, (I) thought somebody was just joking with me." Lt. Greathouse, recovering from surgery for a knee injury sustained while on duty, was unable to ride the motorcycle home. He and his fiancée are having it towed back to New Jersey, and he's looking forward to taking it for a ride after a full recovery. As for advice to others interested in buying tickets in future NLEOMF Harley raffles, Lt. Greathouse said, "If nothing else, the money helps support the Museum and the Memorial, which is the important thing.... Strange things happen - I'm an example." Miss the drawing on May 15? Read about it! The NLEOMF extends its deepest sympathies to the family members, friends and colleagues of Stephen Tyrone Johns for his tremendous display of heroic sacrifice yesterday inside the hallowed grounds of the United States Holocaust Memorial Museum. Mr. Johns – “Big John” to many, for his large stature and friendly demeanor – was a special police officer employed by Wackenhut Services who provided security at the Holocaust Memorial Museum in Washington, DC, for the past six years. Yesterday, shortly before 1 pm, Mr. Johns was gunned down at the entrance to the museum by an 88-year-old, avowed white supremacist armed with a rifle. “Upon entering the front doors of the museum, he raised the rifle and started shooting,” DC Metropolitan Police Chief Cathy Lanier told reporters. Before he could draw his own weapon, Mr. Johns was struck by a bullet and died a short time later at nearby George Washington Hospital. Other security personnel immediately engaged the gunman, striking him down and courageously preventing others from being injured. He was admitted to the hospital in critical condition and has been charged with the murder of Mr. Johns. Describing Mr. Johns as “a wonderful individual . . . a truly jovial human being,” Holocaust Memorial Museum Director Sara Bloomfield said he “died heroically in the line of duty.” Flags at the museum were lowered to half staff, and security officers wore black mourning bands across their badges. The Museum, located just off the National Mall in southwest DC, has special meaning for the law enforcement community. Back in 1999, then Metropolitan Police Chief (and now Philadelphia Police Commissioner) Charles Ramsey joined with the Holocaust Memorial Museum and the Anti-Defamation League to launch a training program called “Law Enforcement and Society.” That program uses the museum and the Holocaust as a "learning laboratory" for exploring law enforcement’s unique role in our free and democratic society. 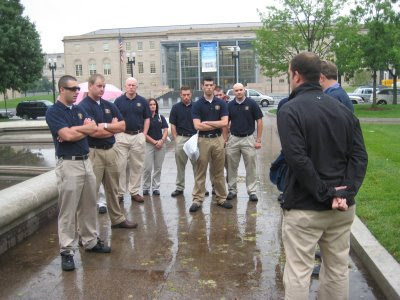 Every MPD recruit and experienced officer goes through the program, and it has been expanded to several suburban and federal agencies, including the FBI. The United States Holocaust Memorial Museum has established a special fund for the benefit of Stephen Johns’s family. Learn more and contribute. Video shot at NLEOMF pre-race hospitality tent at Law Enforcement Appreciation Day, Dover Int'l Speedway, May 31. Drivers Greg Biffle (No. 16 3M Scotchlite Ford) and Jeff Burton (No. 31 Caterpillar Chevrolet) express their respect for law enforcement -- and joke about their encounters with police and speeding tickets. Nearly 600 officers and supporters raised $12,500 for the Memorial Fund. Nearly 600 law enforcement officers, family members and supporters came to Dover, DE, from as far away as Louisiana to take part in the first ever Law Enforcement Appreciation Day at the Dover International Speedway during the Autism Speaks 400, presented by Heluva Good! Sour Cream Dips & Cheese NASCAR Sprint Cup Series race on Sunday, May 31. The event was organized by Dover International Speedway as a way to raise public awareness of law enforcement service and sacrifice and to raise funds for the NLEOMF. The day started with track side tours of the "Monster Mile." Greg Biffle, driver of the No. 16 3M Scotchlite Ford, and Jeff Burton, driver of the No. 31 Caterpillar Chevrolet, stopped by the NLEOMF hospitality tent. Both drivers expressed their gratitude for the sacrifices law enforcement officers make each day to keep our country safe. During the pre-race ceremonies NASCAR fans viewed a public service announcement from driver Jeff Gordon of the No. 24 of DuPont Chevrolet. He asked everyone in attendance to help honor members of the law enforcement community by making a contribution to the Memorial Fund through their cell phones, by texting the word "HERO" to 20222. This was followed by a moment of silence to honor the 18,661 law enforcement officers nationwide who have died in the line of duty throughout history. Bagpipers Patrick O'Rourke (Town of Derry, Hershey, PA, Police), Mike McCann (DC Metro Police Pipe Band), Justin Schauer (Greater Richmond Pipes and Drums) and Jim Livingstone (Henrico, VA, Police) played a stirring rendition of "Amazing Grace," while Delaware State Police and Dover Police Department cruisers drove around the track. Mark Rossi, Vice President of Marketing for Dover Motorsports, presented the NLEOMF with a check for $12,500 based on proceeds from a special promotion offered to members of the law enforcement community for the race. Special thanks go out to the New York State FOP Lodge 911 for providing a 1967 Mustang cop car in the pre-race parade lap, as well as Dover Motorsports, the three NASCAR drivers and their sponsors, and all of the law enforcement officers, family members and supporters who came out for a day of honor and remembrance ... and exciting NASCAR racing. The folks at Dover are already talking about next year's event!